Spicy, savory, aromatic and soul filling. You cannot complain if it is healthy too. 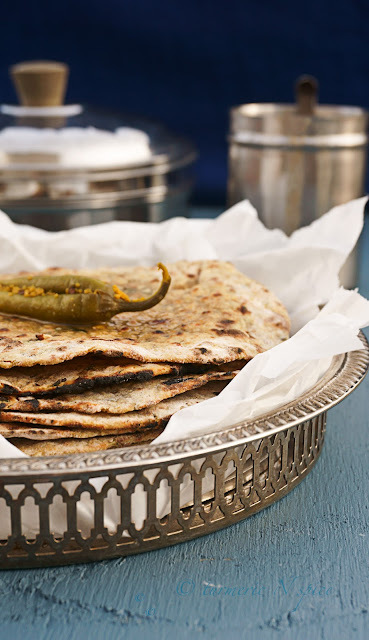 Flat bread or rotis and parathas are my all time favorite. Am not really a rice eater, I prefer bread/ roti/naan/ paratha to rice, any day. Coming from a person who is from the south of India, this is unusual. Brought up in the north of the country, my palette is heavily influenced by the northern cuisine. But, I cannot give up my dosa, similarly, I cannot give up on parathas or rotis. A dollop of ghee, is a perfect accompaniment. 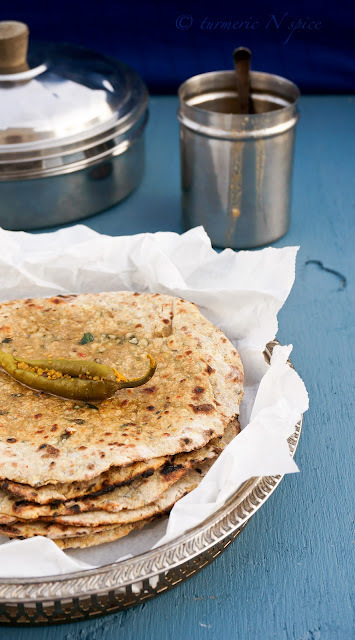 I keep trying out different recipes of parathas and have never been really disappointed. Among all the wild and not so wild experiments in my kitchen, this one is a favorite. Here to stay, repeated many times in the Jois household and each time getting better. It has the goodness of grains n lentils. A meal in itself, when served with some raita or daal. Simple, easy and great for week nights. I shared this recipe with a very good friend of mine and she asked me "what is spelt flour ?" I am sure most of you are aware of this wonder flour. If not... Well, I really did not know that it is older than wheat and I do believe it is a distant cousin to wheat. Easier to digest, and lesser gluten, so can still be substituted for wheat in baking, it needs a little more kneading for the gluten to get working than wheat. Also, a better nutritional profile. Am not a nutritionist, this is just from my reading. Forget about the nutritional profile, am telling the taste profile is awesome, I could tell it is a bit nuttier than wheat, needs less water to kneed into a dough and is absolutely great tasting. So am not complaining ! Roast the moong/mung and cook in water, discard the excess water. Make sure it is a bread crumb consistency. Mash it a bit and let it cool. 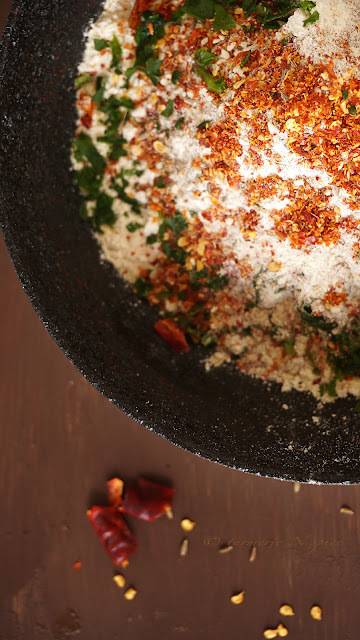 Mix the flour, spice blends, spinach, moong and make a dough. Make sure you add the oil to soften the dough mix. 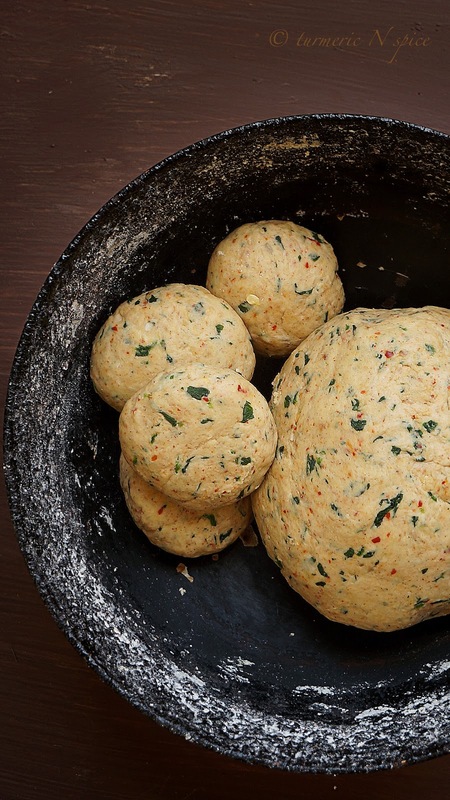 Make small balls with hands, roll them with rolling pin ( don't make it too thin). Roast over a heated pan on both sides and add ghee and roast again, serve hot with raita or curry. You can store the dough in an air tight container for upto a day, probably longer if there was no spinach... am not sure. Tasty flatbreads! Those healthy paratha would go perfectly well with a daahl curry. Looks delicious. A great alternative to gluten free bread. I also prefer breads over rice, and all Indian breads taste wonderful to me. Spelt is a great flour and now I prefer it to wheat. 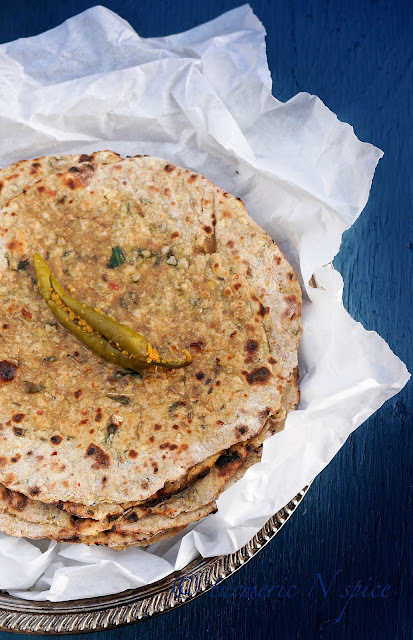 Thanks for sharing your delicious paratha recipe. That's an amazing healthy recipe and I loved the mirchi on top. I have no experience with spelt flour. Will try. Brought multigrain flour from the Indian store and hopefully it will be better than only wheat flour. These look gorgeous, cooked and uncooked. I like the idea of the spelt flour but have never heard of the Jowar flour. My husband did find ghee the other day though. Ive never had lentil parathas. Such a healthy dish! I love that you used different types of flours to create the parathas. They sound and look delicious. First time here and I am glad I am here.You have an amazing blog and lovely presentation! where do you get these kinds of flours? are they all readily available in India? 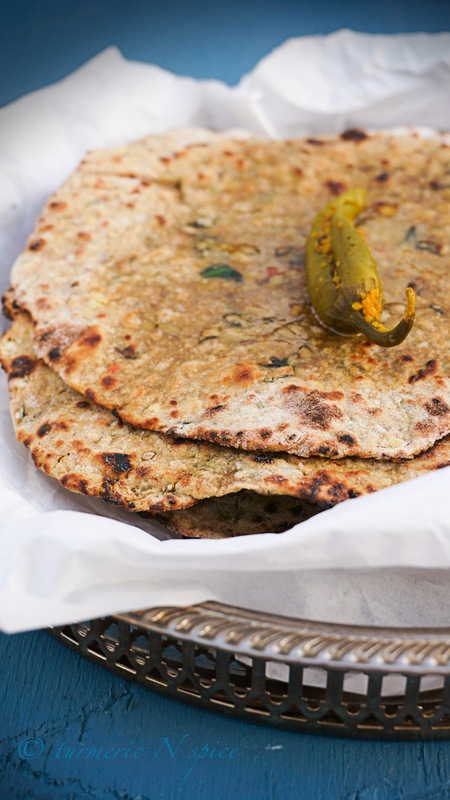 we've recently discovered parathas and would love to try this recipe.